Daniel Brown was born in Chicago, Illinois, and grew up in Memphis, Tennessee. 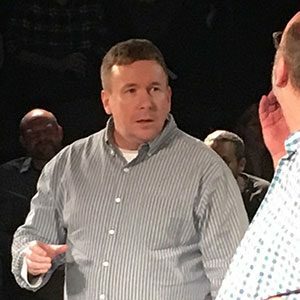 Born in Chicago and raised in Memphis, Tennessee, Dan, a lifelong comedy-nerd raised on Saturday Night Live and Kids in the Hall, first caught the improv bug while in college, performing in the school’s short-form and sketch program, acting in school and community plays, as well as writing, directing, and starring in many comedy short films. After moving to the Washington DC area, he took a free WIT workshop and fell in love with long-form improv with the freedom and joy it presents. He signed up immediately for the Level 1 class and dove straight through the entire program. Dan loves seeing the ‘lightbulbs’ go off above people’s heads when the possibilities of improv and Yes-And start to click into place for them. His approach to teaching is positive, encouraging, joyful, fast-paced, and, most of all, fun. More than anything else, he especially loves seeing the introverts, like himself, cause an entire class to erupt in laughter when they deliver a ‘button line’ with ninja-like precision. He has been a member of indie improv teams Rule 34, Tiny Ikea, Blades of Beauty, Train School, Vendetta, Until One Day, Fish Police, Hellbender, and currently performs as part of Danger Noodle. He coaches the teams Fat American Vampires and Roommate Love. In 2016 he founded Reflex Improv, which is introducing improv to the suburbs of Virginia and Maryland.